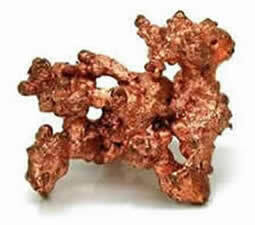 Copper is a metal that is naturally present in the earth crust. On a recent surface sample, it was a pink salmon color. Its nickname is then "red metal". Its name comes from the Cyprus Island where the first copper mines were excavated. This name became cuprum, which gave the word copper. Because it is resistant to corrosion, it is malleable, and it is a good thermal and electrical conductor, copper has always been important for man. Copper was one of the first metals used by man. It was such an important element in the human development that a historical period was even called with its name "the age of copper", and then with alloys "the age of bronze". The age of copper started at different moments according to the regions. The oldest traces were found in Iran, on the archeological site of Sialk III dating back to the 5th millenary BC. Copper objects were located in Anatolia, dating back to 6000 BC. From 4500-4000, we can find the use of the lost wax process in Asia. In China, the use of copper is proved around 2800 BC. In the Andes, metal copper proofs date back to 2000 BC. In West Africa, copper use would have appeared around 900 BC. In Central America, it would be around 600 BC. In Europe, the age of copper is generally situated between 3200 and 2000 BC. The Otzi mummy is a proof of the copper work that was made around 3300 BC because this hunter was found with a copper axe. The age of bronze appears at different moments around the world. This period is defined by the use of alloys with copper and zinc to make brass and of copper and pewter to get bronze. Egyptians seem to have made bronze objects from 3500 BC. In 2400 BC, Egyptians would use copper to sterilize wounds and water. Around 1500 B.C., they would use it to cure headaches, burns and pruritus. The symbol of copper in hieroglyphs is Ankh, the symbol of eternal life. Bronze objects were discovered in Sumerian cities dating back to 3000 B.C. In Europe, bronze mainly developed between 2500 and 600 BC. As for brass, it only became important under the Roman Empire. In the Mediterranean area, copper particularly developed during the antiquity around the Cyprus Island where the first mines were excavated. This allowed the Minoan, Mycenaean and Phoenician civilizations to develop by organizing the metal business. Under the Greek antiquity, metal was known like Chalkos. It was associated to the goddess of beauty, Aphrodite (Venus for Romans) because of the shine of the metal, its use to make mirrors and its Cyprus origin, which was the island of the goddess. Hippocrates recommended copper to cure leg venous ulcers from 400 B.C. Romans named this metal "Aes Cyprium" or "metal from Cyprus" which slowly became copper. This name became simpler being used as cuprum, which gave the word Copper in English. Romans used it as a money exchange between the 6th and the 3d century B.C. They developed the most important copper production. It was not until the Industrial revolution that the production was over passed. Metal mainly came from Hispania, Cyprus and Central Europe. According to the Bible, the doors of the Jerusalem temple were made of bronze. You can also read about the "bronze sea" or the "brazen sea" in the temple of Salomon (1000 B.C). It would have been a circular tank that was able to hold 45 tons of water. It was based on 12 bronze ox sculptures. Another curious copper object is the copper roll of the Dead Sea, more precisely from Khirbet Qumrân. As opposed to other manuscripts of the Dead Sea that were written on leather or papyrus, this one is written on almost pure copper. It mentions a treasure. One assumes that it is the one of the second temple of Jerusalem. The location given on the document is still not well identified. In India, before 1000 B.C., copper was thought to have healing properties, mainly in the holistic ayurvedic medicine. In Irak, in Bagdad, a curious copper object dating back to 248 B.C. was discovered. This object is made of copper cylinders that were soldered with lead. They were inside a ceramic which was about 15 centimeters high. Some people think it is the first battery of humanity... But this use has not been proved yet. In America, Aztecs would use copper to relieve sore throats. In the periods following the antiquity, copper lost its importance compared to the steel industry. However, it was still omnipresent. It was used as money, then in the art field and then to other fields. In the Renaissance period, it was used a lot in sculpture but also to line ship hulls. This was the case for the boats of Christopher Columbus. It was also used to make bells mainly because the type of alloy allowed playing on the sound. It was not until the 19th century that copper gained again prominence in its use in the electric industry (wiring…), plumbing, superconductors… It is the third most used metal behind iron and aluminum. In the popular culture, copper is often associated to the Venus planet. Therefore, it symbolizes femininity, youth and love. Copper is the symbol of the 32nd anniversary for marriage. In alchemy, a stylized mirror symbolizes copper. This same object symbolizes the Venus planet. Mines: Chili, the USA, Peru, Australia, Russia, Indonesia, Canada, Zambia, Poland. Copper would allow balancing blood flow and would help the circulatory system to work properly. It would be useful in the treatment of bone problems. It is used in the treatment of arthritis and rheumatisms. Copper would be recommended to regulate sexuality. It would be efficient against inflammation, envenoming and intoxications. It would protect the kidneys, the spleen and the gallbladder.